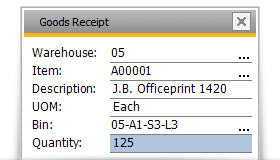 WiSys inventory management for SAP Business One provides real-time inventory transactions and tracking using barcode scanning. Typically, a Goods Receipt PO is done on a mobile device so that materials can be scanned from the receiving truck (the first touch point in the organization) and remain mobile in the receiving dock. 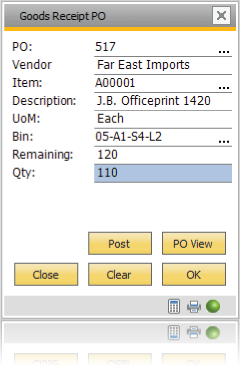 As Items are scanned, the open PO’s, line items and other item attributes (Serial/Lot Information, etc.) are scanned or entered. 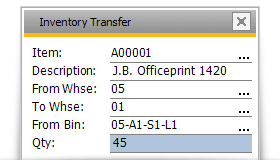 The transaction is then posted and material information is available in SAP Business One. Take maximum advantage of the warehouse logistics benefits of Bins by receiving material to a Dock bin and then transfer the material to the stocking bin using the Put Away feature.